In Ensuring Poverty, Felicia Kornbluh and Gwendolyn Mink assess the gendered history of welfare reform. They foreground arguments advanced by feminists for a welfare policy that would respect single mothers' rights while advancing their opportunities and assuring economic security for their families. 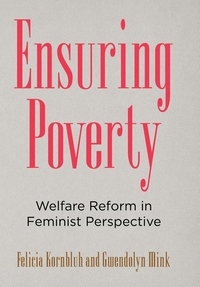 Kornbluh and Mink consider welfare policy in the broad intersectional context of gender, race, poverty, and inequality. They argue that the subject of welfare reform always has been single mothers, the animus always has been race, and the currency always has been inequality. Yet public conversations about poverty and welfare, even today, rarely acknowledge the nexus between racialized gender inequality and the economic vulnerability of single-mother families. Since passage of the Personal Responsibility and Work Opportunity Reconciliation Act (PRWORA) by a Republican Congress and the Clinton administration, the gendered dimensions of antipoverty policy have receded from debate. Mink and Kornbluh explore the narrowing of discussion that has occurred in recent decades and the path charted by social justice feminists in the 1990s and early 2000s, a course rejected by policy makers. They advocate a return to the social justice approach built on the equality of mothers, especially mothers of color, in policies aimed at poor families.